Islands in Quebec = Opportunities to explore and eat well. Île d'Orléans proved a wonder, and l'Isle-aux-Coudres in Charlevoix knocked off our well-worn socks. It’s just a short ferry ride away from Baie St. Paul, small enough that you can ride bikes around it instead of a car, and has a population of about 1,250. It was named by Jacques Cartier in 1535, when he arrived and observed the island’s abundance of hazelnut trees (“coudriers”). 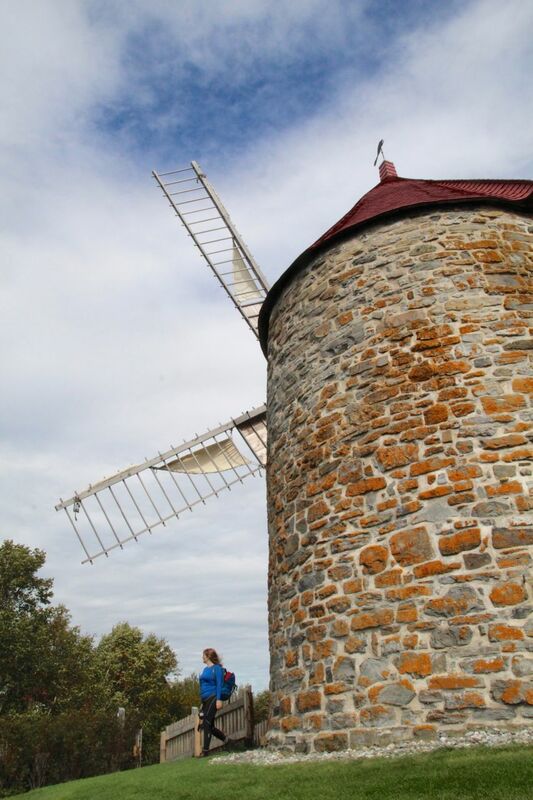 We visited another historic mill, this one called the Moulins de l'Isle-aux-Coudres. Like Moulins de la Remy, it’s a fully-restored flour mill from the 19th century, though there are actually two mills on this site - one powered by water (completed in 1825) and the other by wind (built in 1836). They were both utilized until 1948, when industrial milling took over. Restoration began in the 1980’s, and the mill now serves as a heritage site. This is an original inscription of the date by the mill’s builder, Mr. Alex Tremblay. He also left his initials and the abbreviation of the Grand Seminaire de Quebec, whose priests were lords of the land from 1687 until the abolition of the seigniorial system in Quebec in 1854. Another highlight of our l'Isle-aux-Coudres visit was Boulangerie Bouchard, a bakery that’s been around for decades and is currently owned by Noëlle-Ange Harvey. While the food was exceptional, she left the greatest impression on us; a woman like sunshine, Noëlle-Ange was welcoming and enthusiastic, wanting to share everything she knew about the island and her bakery. She took us into the back, pointing out all the equipment that’s been used since the 50’s, including the silky, well-worn handle of the baker’s peel, a hand-cranked mixer (the likes of which I have never seen), and vintage scales. She even took us into their side kitchen just to point out the view. Noëlle-Ange appreciates the small things, laughs a lot, and loves what she does. I bet she gives the BEST hugs. Let’s just focus on that second treat, because it may shock you if you’ve never heard of it. This is a dessert called SUGAR PIE WITH NUN’S FARTS. Sugar pie is one of Quebec’s greatest gifts to the world, a calorie bomb that’s similar to a butter tart, but without nuts or raisins added. For the sweet tooth, it's dangerously good, but I do mean DANGEROUS. Eat too much of this stuff and your heart might stop. Valerie Lugonja has written a great post about its history (with recipes!) on her blog. The sugar pies on l'Isle-aux-Coudres are unique because they're topped with the pets du soeur, which you can also buy individually with various fillings. The sugar pies at Boulangerie Bouchard were so moreish, we eventually had to sprinkle ours with leftover pork crumbs so we’d stop eating. But let’s not discuss this lack of self-control any further, please. l'Isle-aux-Coudres is certainly worth a visit, and don’t worry about packing a lunch to eat. Click here for a full list of the places you can visit while there.